There's an awful lot of controllability squeezed into this diddy box. Worth considering if you need a portable controller. Good value for money. Lots of control within a small footprint. Backlit drum pads. Mini keyboard won't be to everyone's taste. The keyboard is raised above the rest of the upper panel. Might not be tough enough to regularly throw into a gigbag. Laptop-based studio and live rigs have decreased in size and increased in functionality and portability in recent years. To complement these setups a new breed of controllers has appeared. The SubZero SPC Mini Key and Pad MIDI Controller is one such example of this, cramming bags of functionality into a compact footprint. The Mini's upper panel is laid out in two sections. The front half is raised and is where you'll find a two-octave mini-key keyboard. A lower, rear half houses the Mini's eight drum pads, four sliders, four rotaries and its control switches. Having the lower section at the rear seems rather counter-intuitive to us and is perhaps not the most ergonomic design. Why not have the front section lower than the back section? The only connector on the unit is a mini-USB connection cable, which is included in the box alongside a mini-CD containing the manual. Notice the recurring theme here? Everything is small. To match the unit's modest size, it is also impressively lightweight. This combination makes it, theoretically, perfect for shoving into a gigbag. In reality, the SPC Mini might not appreciate being 'shoved' anywhere - the frame isn't the most robust and the drum pads have a tendency to pop up if bashed hard. Operation is simple and straightforward. The USB connector provides bus-power, so as soon as you make this connection the SPC Mini springs to life. This is most immediately demonstrated by the red LEDs that show the current octave to which the keyboard is set. By pressing the left- or right-arrow buttons above the LEDs you can jump to the octave of your choice easily. To keep the Mini's footprint compact, traditional pitch bend and modulation wheels have been sacrificed. The lack of these wheels does compromise the SPC Mini's playability somewhat, but real-time performance is still a viable option as these functions are accessible via buttons. All that said, for its size, the level of control the SPC Mini offers is impressive. By default, the rotary dials and sliders are designed to output specific MIDI controllers, but these can be edited to control the parameters of your choice. There's CC mode, too, activated via a dedicated button. Using this, it's possible to stop note output from the keyboard altogether and use the keys as MIDI control triggers to modify a wider range of software functions or settings. Once you've got the parameters you want configured, you can save them to the SPC Mini itself. The machine can remember up to four different configurations, making it easy for you to recall different setups for your studio rig, your live rig, and so on. 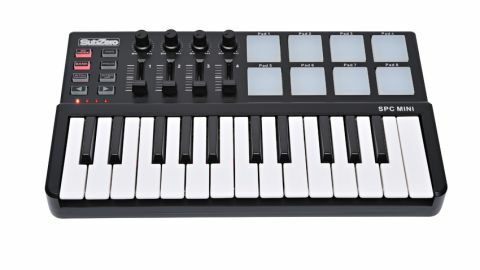 The SubZero SPC Mini Key and Pad MIDI Controller is a worthy addition to an increasingly popular format. This small, compact controller offers plenty of flexibility within an extremely portable frame. If you're happy with its design compromises, there's no doubt it represents good value for money.